Maid Hunting - Akihabara Maid Threatened with a Knife and Molested, Otaku Heaven in Danger? 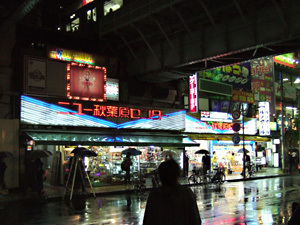 Akihabara is known around the world for its otaku culture and maid cafes. Not only is Akihabara a hot tourist spot, but it also serves as a place for geeks and otakus to "heal their spiritual wounds." A few days ago, a shocking event took place in this otaku heaven that sent tremors throughout the otaku world - a maid was threatened, and subsequently molested, by a man. This incident is now being called "Maid Hunting," named after the controversial "Otaku Hunting" event that took place earlier this fall in Akihabara. According to reports, around 7:00pm on October 17th in front of the JR Akihabara Station, a 18 year old girl dressed as a maid (who was handing out flyers) was approached by a man. The man asked, "Are you a college student? Where do you work?" The maid was then asked to bring the man to the maid cafe she worked at. When they were climbing the stairs of the maid cafe, the man suddenly took out a small knife, and proceeded to forcefully molest the maid's lower body. Luckily, the attacker ran away after his victim let out a scream. The police is now investigating this case. According to the assaulted maid, the man was around 160cm tall, wore glasses, somewhat skinny, and looked to be between 20 to 30 years old. After this incident, many visitors of Akihabara have expressed that assaulting a maid is unforgivable and must not be allowed. However, some maids revealed that this is not the first time such incident has occurred. It's common for drunken customers to act "inappropriately" when in contact with a maid. As the investigation continues, more information regarding the victim has been revealed. 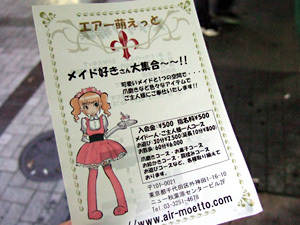 The assaulted maid works at a maid cafe called "Air-Moetto," a new maid cafe opened on May 11th that apparently provides "sexual services" to its customers: spending 30 minutes alone with a maid costs 3,000 yen, 60 minutes costs 6,000 yen. Centering its business on "Maid Communication," the cafe's propaganda quote is "This cafe is not your regular Maid Cafe" (The meaning of this quote will be left to reader's imagination). According to the cafe, this incident has already happened once before. When interviewed, many maids who works at Air-Moe has expressed their concern that the cafe's misleading propaganda has given many customers a false perception of way their cafe operates. Even though the maid is at fault for working for a cafe like "Air-Moetto" in the first place, is the cafe also responsible for the victims of its excessive propaganda? As Akihabara becomes more popular, the number of serious incidents also begins to increase. There are already 25 reported incidents this year, many more goes unreported. When asked, a man shopping in Akihabara said: "When something like this happens, no one will come to your rescue. Reality can be very different from what was told in Densha Otoko." A Japanese video report on this incident can be found on YouTube. Submitted by HuhWhat (not verified) on Fri, 2006-10-27 15:33. Submitted by JPONRY (not verified) on Tue, 2007-07-03 11:55. Let's see... thin, black hair, glasses... that equates to about 97% all JP males right? Submitted by grand canyon tours (not verified) on Tue, 2008-03-18 14:52. I have no respect for people who encourage crime. Stereotypes? If you people get out & see what the world is like beyond your computer screen you'll in for a shock. How sad. Submitted by Gil (not verified) on Wed, 2009-01-07 19:50.